Follow this guide to get the most out of your free trial and help your team optimize their workflow. The newest memeber of your team is the @jira-plus bot. You can find the bot under people or Apps and interect directly but the best way to use the solution is in your channels. Great - now the bot is in the channel. Repeat this process for all of your relevant channels. Now that the bot is in the channel you will start to get details of your tickets when discussed by your team members. Keep going to get the real value but configuring your channel. Click the Configure Channel button to bring up the configuration screen. Use the Quick Create section to setup your channel for easy issue creation by providing a default project and issue type. 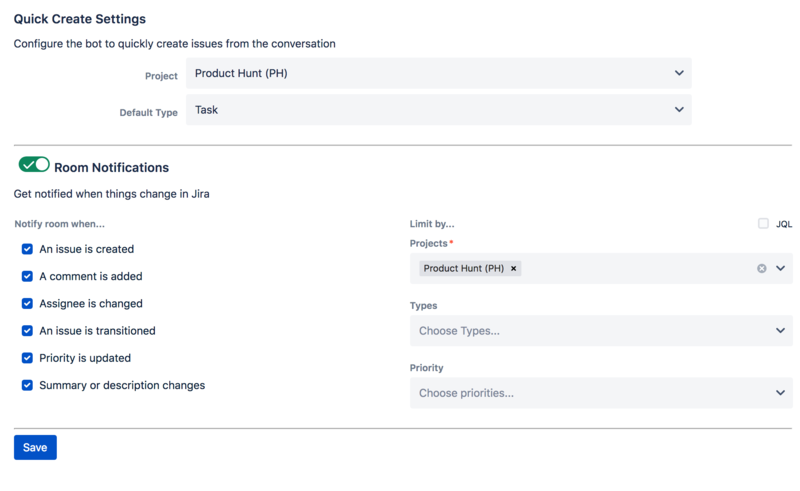 Use the Room Notifications section to turn on notices in Slack when issues are updated in Jira. This option ensures everyone stays up to speed regardless of where the issue is updated. We know this can get a little loud depending on how you set it up - use the filters to ensure you are only notified about what you need. Switch to JQL mode to get more advanced with your filters. Check out these docs to learn about all the features of the integration. Take 5-10 minutes to explore the features and ensure you get a chance to try everything out. Take the 30 days to give the features a try, at the end of the trial you will need to decide if you want to stay with us. Thanks for checking us out regardless!